Although my site is called "Toddler Approved," we actually share activities and crafts for kids ages 0-6. Do you know why? Toddlers grow up! When I started this site almost five years ago my son was only 18 months old. Now he is six years old. Crazy! 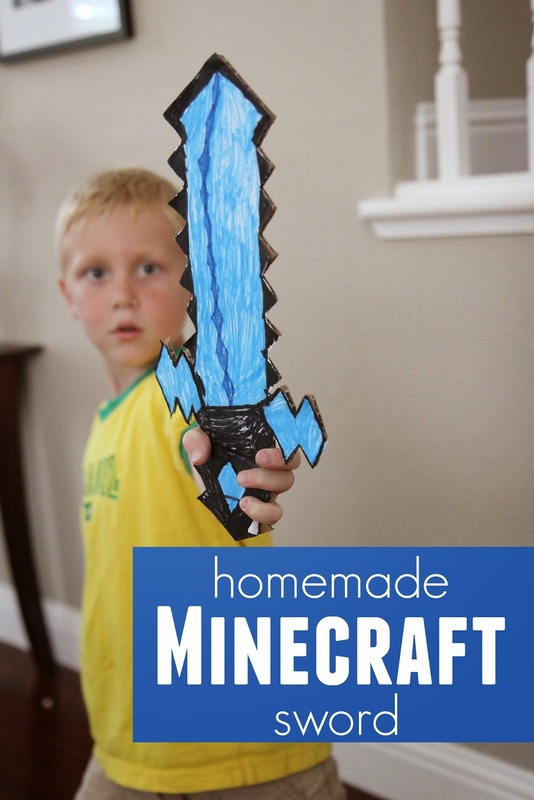 Today I am deviating a bit from my normal simple toddler play posts to share a DIY Cardboard Minecraft sword project that my son came up with and wanted to share! My kids are currently ages 6,3,2. Our toddler and preschooler actually had a whole lot of fun with this craft activity too, so it was a hit for the whole family. Minecraft is a game that my son plays on our Nexus 7 tablet. You can get the game in a variety of formats for download on phones or gaming stations. My son absolutely LOVES the game and wishes I would let him play it more often. Minecraft allows players to build cool structures with textured cubes. I love how my son uses it to create imaginative things. In Minecraft players use swords to break blocks and in combat. I have a love/hate relationship with the game... since it is addictive. My son gets limited play time on the tablet, so he loves to find other creative ways to doing Minecraft themed activities when we aren't having screen time. One afternoon he asked if we could make Minecraft swords. I loved the idea and hoped that we could just go online and download one that was already designed and print it off... but he wanted to design his OWN! So, I hand drew our own template. It isn't perfect, but it has worked wonderfully. You can download it for free below. This is now a favorite activity when his friends come over and want to play Minecraft and I want them to do something more creative. First you have to print off the sword onto computer paper and then create a design on the paper. Next you need to cut out the sword and then use the outline of the sword and trace it onto a piece of cardstock. After that, cut out a sword from the cardboard and match it up with the paper sword. Attach the paper sword to the cardboard using double-sided tape or a spray adhesive. You can do a design on both sides of the sword or leave one side blank. Once the swords are created then you are ready to go on a mission to break blocks or go hunting. These swords aren't really for sword fighting where they come into contact with one another since they can break. They are only made out of cardboard. I encourage the kids to use them for pretend play, not for actual contact. Do you know what Minecraft is? Does anyone at your house play it?